This invigorating Ultimate Moroccan Argan Oil® Mint Conditioner is specially formulated to effectively condition and detangle your hair while leaving it soft and shiny. this conditioner features a protective fusion of moroccan Argan oil essence, which helps ton invigorate, calm and treat the scalp and hair shaft. 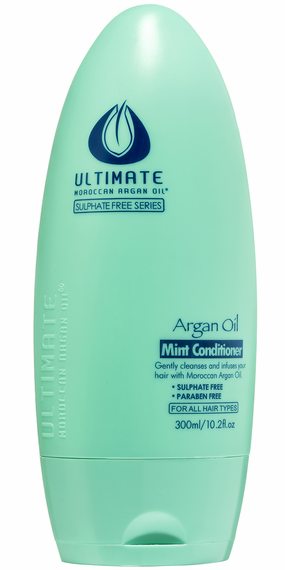 Ultimate Moroccan Argan Oil® Mint Conditioner has a calming effect on hair strands, making them soft and manageable. the dreamy, relaxing fragrance of this fresh mint conditioner will leave your hair with an amazing and energizing scent. After Cleansing with Ultimate Moroccan Argan Oil® Mint Shampoo, gently Squeeze Excess water from hair and apply conditioner from scalp to ends. Leave on 1-2 minutes then rinse well. Avoid contact with eyes.